​Seven is considered a lucky number for a lot of people and it couldn’t be more fortunate for Stena Line passengers as they can now set sail from Belfast to Cairnryan or Belfast to Liverpool from £7 per person! 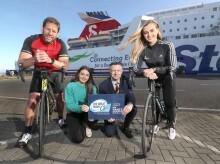 ​Leading ferry company Stena Line has just confirmed its support for the 2019 Great Rugby Cycle, a 16-day charity cycle ride from John O’Groats to Land’s End (4 – 20 March) in aid of the My Name’5 Doddie Foundation. ​Harland and Wolff Shipyard Chosen for Ferry Refits Leading ferry company Stena Line has started work on a £5m refit programme of its local ferry fleet at Belfast’s Harland and Wolff shipyard. 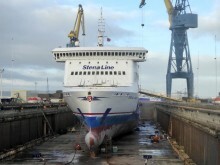 The 10-week upgrade schedule will see five Stena Line vessels dry docked consecutively to facilitate refurbishment and maintenance works. 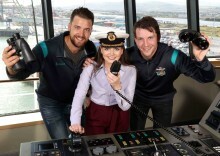 ​Northern Ireland’s leading ferry company, Stena Line, has announced that it has renewed its sponsorship of the Belfast Giants for the eighth year running and to celebrate, is offering fans the chance to meet, greet and sail with their heroes on a Stena Line Belfast Giants Cruise, from £22 per adult on Saturday 1st September. ​One of the two new E-Flexer RoPax ferries bound for the Belfast – Liverpool route in 2020 has recently marked an important production milestone by celebrating its official keel-laying at the AVIC shipyard in Weihai, China. The new vessels will have capacity for 1 000 passengers, 120 cars as well as 3 100 freight lane meters. ​STENA LINE is inviting Northern Ireland magic and music lovers to sit back, relax and enjoy the brand-new Magic and All That Jazz non-landing cruise from just £15 per person. ​Stena Line has confirmed that it will be introducing two of its three new ships onto its Belfast – Liverpool service in 2020/21. The first of its new RoPax ferries currently under construction in China is planned to enter service on its Dublin-Holyhead route in early 2020. 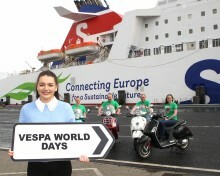 ​NORTHERN Ireland’s leading ferry company Stena Line has been unveiled as the headline sponsor for Vespa World Days (VWD) which takes place at Titanic Quarter, Belfast from June 14 to 17, 2018. ​Leading ferry company Stena Line has just launched the Irish Sea’s first dedicated onboard passenger recliner suite... the Hygge Recline Lounge. ​DUE to a significant spike in seasonal demand, leading ferry company Stena Line has added extra sailings on its Liverpool to Belfast service this Monday December 18. The extra passenger capacity will be provided by an additional 10.30am sailing departing Liverpool and Belfast simultaneously. ​DUE to a significant spike in seasonal demand, leading ferry company Stena Line has added extra sailings on its Belfast to Liverpool service this Monday December 18. The extra passenger capacity will be provided by an additional 10.30am sailings departing Belfast and Liverpool simultaneously. ​WITH lots of holidays just around the corner including Halloween and Christmas, leading ferry company Stena Line would like to treat customers to a great value travel offer which is available right through to January 2019 and allows holidaymakers to receive a huge 20% off motorist fares* when booked by October 31 2017. ​Last month Stena Line launched a Group-wide Coffee Campaign to support the Mercy Ships charity in its effort to deliver free, world-class health care to people in need in the developing world. ​AUTUMN has well and truly arrived and whilst the cool, crisp weather may make people want to stay indoors, Stena Line is encouraging everyone to book a short break or long weekend away in order to stave off the dreaded winter blues which are just around the corner. ​Fans were delighted to be introduced to the Stena Line mascot ‘Happy’ for the first time! ​THE Stena Line Belfast Giants are celebrating after securing their biggest re-signing of the season, as leading ferry company Stena Line announced that it will once again become the ice hockey team’s title sponsor in 2017/2018, for the seventh successive year. 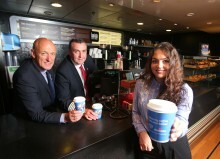 ​Stena Line is launching a Group-wide Coffee Campaign (Fri 1st Sept) to support the Mercy Ships charity in their efforts to deliver free, world-class health care to people in need in the developing world. ​AUGUST is here already, but don’t worry if you haven’t found the time to book a summer break or short trip away yet as leading ferry company Stena Line has launched a sale which will allow customers to save up to 15% when taking a car to Britain. ​Stena Line’s parent company has confirmed a multi-million pound investment package to acquire the Superfast VII and Superfast VIII ferries which operate on its Belfast-Cairnryan route. ​TRAVELLING with Stena Line offers many perks including free movies, free Wi-Fi, kids play areas and a range of delicious places to eat and now the leading ferry company is offering even more reasons to get excited with their new Pick a Perk offer.